L. Caecilius L.f. Q.n. 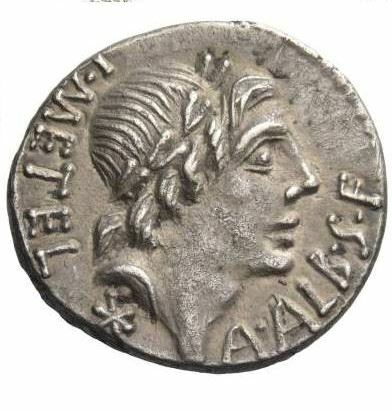 Metellus Delmaticus was one of the moneyers for the year 96 BC. Caecilia was a plebeian family at Rome. Members of this gens are mentioned in history as early as the fifth century BC, but the first of the Caecilii who obtained the consulship was Lucius Caecilius Metellus Denter, in 284 BC. From the consulship of Lucius Caecilius Metellus Denter, the family of the Metelli became one of the most distinguished at Rome. In the latter half of the second century BC, it obtained an extraordinary number of the highest offices of the state. Quintus Metellus, who was consul in 143 BC, had four sons, who were raised to the consulship in succession; and his brother, Lucius Metellus, who was consul in 142, had two sons, who were likewise elevated to the same dignity. The Metelli were distinguished as a family for their unwavering support of the party of the optimates.